CYCLINGFORUM.COM -- View topic - OT - French Press technique? OT - French Press technique? ... wasn't exactly what I would called a success. Taste was a little better than drip coffee but far cry from French Press. That's until I figured out I probably should try the "inverted" method, as I noticed the water started dripping before i started the 'press'. So, further experimentation next weekend. Though once I started to let it sit and soak, I'm back to the lengthy process just like with the French Press. So I'll have to see if I like the taste any better. Otherwise, I could just stick with the French Press. The convenient factor is there. But then, so is the French Press. Aeropress does have the edge that I can take it with me camping. Though the reality being, I don't camp all that often these days. So it's mostly only a theoretical advantage at the moment. Of course you are. What about wine and beer tablets? But it’s interesting to know some silly information, that caffeine is so addictive that they have to be taken as pills! I dont think they HAVE to be taken as pills, the are mostly used by people who are trying to stay awake but don't want ti drink heaps of coffee as it can affect their stomach. Using the "inverted" method and letting the coffee soak (steep in coffee talk). It produces stronger coffee but also more bitter. Not quite what I've been looking for. Based on what I've read so far, it's probably due to the difference between paper filter vs non-paper filter. As I have some leftover paper filter before the drip maker broke, I can try #1 this weekend. In the meantime, I'll be ordering #3 (as it's not locally available). Of course the coffee is going to vary with the beans you use, how it is ground, and how much water and coffee you use. I don't bother to let it steep and get strong coffee I like, YMMV. Same bean, same amount of coffee and water (I vary the grind to get the best result of each brewing method). I still like the flavor of French Press by a long shot. I believe it’s the filter that’s responsible for the different result. Because French Press and aeropressbis essentially the same process after all. Hence my plan to test the French Press with the added sludge filter. The Bieletti of course, is an entirely different process. And it doesn’t seem too much hassle. So I’m giving that a try too. But hopefully, my options are narrowing down not expanding. I only use the press with a piece of paper filter. As I said above, it is just a slow press, but worth the extra 45 seconds. Just put the press on something that won't allow a slide during the extra pressure of pushing to overcome the added filter. April dislikes the quality created by a paper filter, and the time and inconvenience of a French press. So by adding a filter to the press, she gets the worst at all worlds! But possibly she avoids a few grounds, which you you don't have to drink anyway. In my lifetime I've drank so much coffee that goes through a paper filter that I don't conceive of that as a problem, but hey, I'm not a coffee blogger! ... in his logic. If what I read was true, I probably won’t like the paper filter in the French Press. If I like the result, however unlikely according to Dan’s excellent logic, there’re ready made paper filter made for French Press one can buy. So I wouldn’t have to cut them every morning as Dan suggested. It would simply be like a regular French Press. Today I work from home. So there's time to make another brewing experimentation. As both Dan and myself expected, French Press with paper filter delivered similar result as AeroPress. Actually, slightly worse from one aspect. 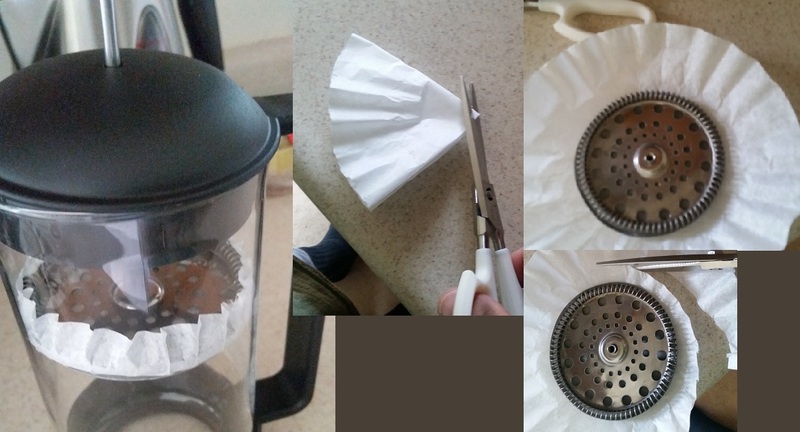 As my hand-cut paper filter didn't EXACTLY match the shape of the plunger, some sludge got through. Though it wasn't objectionable amount. So in that regard, it was a success in REDUCING the sludge. But unfortunately, it reduced the flavor considerably. I'll do the last round of experimentation with Bialetti next week. That should conclude my coffee maker quest. Brew was just as good, if not even better than even the French Press! But the process needs work. Right now, the electric heater is really slow. On the other hand, since it has a auto shut off, I could do other breakfast'y work in the mean time. The more daunting issue is the Bialetti itself is hot so can't be cleaned till it cools down. That makes it quite impossible to brew-n-run in the morning. It also came with a milk frosing thingy which I will try tomorrow. If that piece works, it's staying. But I might need to decide on something else as a brew-n-run option. Today I used the milk frother that came with the electric Bialetti. It's way better than the one in my old (now dead) Cappuccino maker. It froth milk in less than 30 second without needing any attention. Clean up was a no brainer too. I'm sold. Even if it's for frothing milks only, it justified its position in my kitchen! And it also makes smooth and strong tasting coffee. So it's a clear winner! I made myself a large cup of Americana. I never order that in most coffee place because I usually found the milk dilutes the coffee too much. But with the strong coffee this thing makes, it works out great with the frothed milk. Only (but significant) drawback is it takes far longer time to make the coffee ready (albeit no attention needed). And even longer wait for it to cool down before I can clean it. Not a problem if I'm working from home, but not ideal if I'm running out the door at crack of dawn to work/ride/ski. So it's not for the rush-out-the-door morning coffee. For that, I'll have to go for either a Kerig setup with a reusable filter or just a plain-n-simple drip coffee maker for days when I'll drink coffee of whatever quality. Still, I can see I'll use the Bialetti far more frequently than my previous espresso maker because it's far less hassle and still very good result (for my personal taste). After that many months of paper filters I quit; so I'm back to sludge in the bottom of the cup. I usually leave an inch of coffee on top if it, so what's the point. Now I'm back to pressing like it's a TNT detonator and I'd forgotten how satisfying that is, and symbolic to boot. My GF sold me on Kona, no more evening time burning like French Roast. The problem is Kona disappears from the shelves sometimes. I tried Summatra and darn if it's the tropical breeze or something, but it works. Plus it's pretty dark, almost like French.